Everyone’s looking for a leg up, the next big thing, the new niche market. 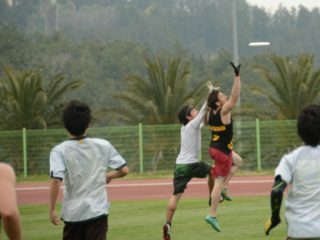 For many sporting good companies, ultimate might be just that niche they’re looking for. And the attempts to integrate have already begun. Take the ScoreBand, for example — a product originally designed for tennis and golf aficionados, and winner of the PGA “Best Product Concept” Award 2012. A thin, multi purpose, silicone (read: Livestrong material) band with a four digital display modes: time, scorekeeping, tennis, and golf. One Seed LLC, maker of ScoreBand, is now looking to foray into the ultimate scene after immediate success in the tennis and golf markets. The common denominator? Self scoring and officiating. Much like ultimate, tennis and golf have large grass-roots and “pick up game” communities who play the sport purely for the love of the game, and assuredly without any officiating. ScoreBand fits neatly into these grass-roots niches by allowing athletes an accurate, easy-to-use scoring system available anytime, anywhere. But how well does this convenient wrist scoreboard lend itself to the everyday ultimate player? Let’s find out. I’m an average guy, especially when it comes to sizing. (Editor’s note: …lol). Medium jerseys, medium s horts, size 9.5 shoe, and three button snaps in on every trucker hat I own. So it was with some trepidation that I decided on a size large ScoreBand, but in hindsight I’m very thankful I did. The band fits snugly yet comfortably around my (admittedly smaller for a male) wrist, with added ridges on the interior of the band to discourage slipping down the arm. ScoreBand offers sizes S-XL, and as far as I can tell, sizes small/medium are meant for the ladies/kids and sizes large/extra large are meant for the guys. I’d be interested to see how well ScoreBand accommodates the extremes of each end of the sizing spectrum, but does well to encompass everything short of the outlying extremes in the current sizing design. An all-around good fit, but loses a point to not distinguishing between male/female, and child/adult customers, 4 out of 5. The one-piece design gives ScoreBand serious durability. Anyone who has worn a Livestrong type bracelet knows they are nearly indestructible even when worn constantly. Extreme heat and cold, and even daily activities such as showering are no match for this type of silicone construction. While showering with the ScoreBand isn’t recommended due to the internal parts, the band is water resistant so a little sweat while playing is no big deal. The area where SB loses points in this category isn’t due to any type of defect or lack of features. Look, ScoreBand is tailor-made (golf pun unintended) for tennis and golf athletes and is only beginning to test the waters of ultimate. It’s no surprise then, that ScoreBand in it’s current state doesn’t quite fit perfectly into the ultimate niche as closely as it does with golf or tennis. If the intention is truly to become a mainstream option for ultimate scorekeeping, ScoreBand must be advantageous to all types of ultimate players. The problem I foresee lies with the competitive end of the ultimate spectrum. If you’re someone who likes to layout, ScoreBand may not be your on-field accessory of choice. The digital display is too fragile to be capable of handling the hard impact of an ultimate layout on any surface short of sand. Remember, it’s not designed to, but if ultimate is a target audience for One Seed, the display will have to be reinforced. Many times on straightforward layouts, silicone bands tend to roll up the arm due to sliding along the ground and can even rip out sensitive arm hair. The same is true of the silicone ScoreBand. My right arm (I’m lefty, wear my watch on my right) is devoid of some hair now thanks in part to my general over ambition on the field, and in part to the chemical makeup of the ScoreBand. 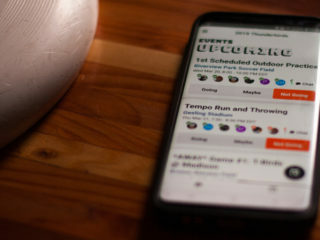 If you’re someone who enjoys ultimate in a more laid-back, pick-up type atmosphere where layouts are few and far between, ScoreBand makes a great way to ensure the weekly park romps don’t last hours before someone asks ‘Does anyone know the score?’ ScoreBands could become popular with ultimate coaches, but the invention of the clipboard somewhat fills the scorekeeping void in this case. If you’re a coach who needs more room on the stat sheet, keeping score on the ScoreBand could provide you some reprieve. 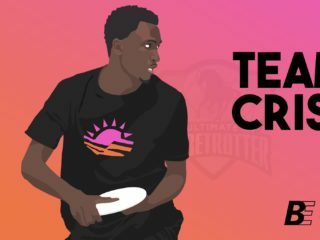 If ultimate is truly the niche market ScoreBand wishes to attack next, One Seed must address these two issues in one way or another. As it stands, ScoreBand definitely has some upside in ultimate, 3 out of 5. The band itself comes in black or white, and each band has seven different button color combinations to choose from, including a special P.I.N.K design for breast cancer awareness. That’s 14 possible combinations, enough to match any team’s color scheme if desired. The two-tone color combinations bump up the style a notch from similar monochromatic, silicone Livestrong or breast cancer awareness bands, but ScoreBand still maintains the low-profile style these types of bands bank on. Not an accessory to wear for a night on the town, but that’s not the point. The point is functionality on the field/course. Plenty of color combos to match any team theme, all while maintaining a functional low profile. Not a product that will catch your eye right away necessarily, but one that piques interest with use during gameplay, a quality unique to the brand. ScoreBand nails its target here. 5 out of 5. Scoreband retails for $26.99 and ships anywhere in the country as well as some cities internationally for a $5 flat rate. If you don’t want to get stuck paying the shipping costs, you can also find them at these retailers. I’d honestly like to see ScoreBand come down to the well-known (yet creepily comforting) $19.99 price point. Nearly $32 after shipping seems a bit high for one ScoreBand, but I could certainly see myself becoming convinced to purchase if the total were nearer to the $20-25 price range. Not bad, but ScoreBand might want a mulligan on this one, 3 out of 5. Great color choices in a low-profile, yet functional band with a surprisingly comfortable fit. If ScoreBand truly wants to dive into ultimate as a leader in on-field scorekeeping, there are some hiccups to attend to, but for the most part would do very well to consider ultimate in their future marketing targets. Part of the allure of ultimate is how inexpensive the sport is to play, bring the price point of ScoreBand down slightly and you’ll really have our attention. Even at the current price, ScoreBand still makes a great stocking stuffer for the ultimate player who already has everything Five, Savage or any of the other ultimate retailers make. Overall, 4 out of 5. Be sure to check out the intro video below!